Designed for who always needs more space, these beds can be provided with openable bases and storage containers or solid pull-out drawers on wheels. 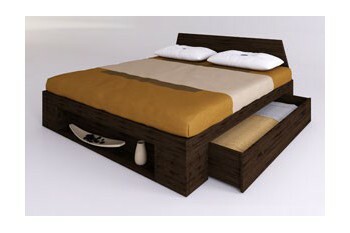 Yenn bed is very compact and provided with a useful storage box. It's made up of solid laminated beech wood and you can choose between a normal slatted base or a solid openable base, available in two models. The price includes the standard slatted base. 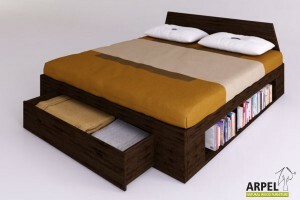 Bookcase box bed equipped with openable base. The available bases can be openable only to 45° or even horizontally, useful when changing the sheets. Inside the bed there is a practical bottom panel to protect from dust. In this version, the b ookcase area is on all 4 sides. The Bali box bed in solid beech wood is the perfect solution if you need extra space but aren't ready to sacrifice the design of your bedroom. This bed available in a single or two-coloured version is provided with a mattress base that can be opened at 45° or even horizontally. The horizontal opening is especially useful when changing the bedding. 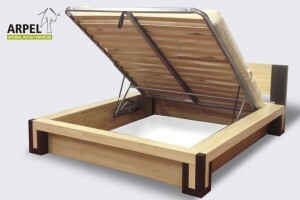 A very compact bed accessorized with two lateral drawers that slide out on turning castors. There is also a bookcase module at the foot of the bed but it can be excluded on request. All drawers are under the bed and don't take up any extra room. Slats are included in the price. Size starts from 120x200 with a minimum height of 35cm. 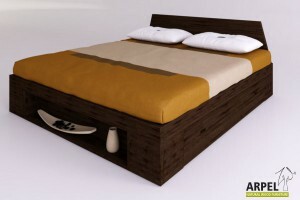 A very solid bed accessorized with one frontal drawer that moves on turning castors. The sides are equipped with bookcase modules that can be excluded upon request. The drawer lies completely under the bed and does not take up any extra space. Slats are included in the price. Size from 120x200, minimum height 35cm.